Blondie and Brownie: It's National Ice Cream Sandwich Day! There are some tasty, tasty ice cream sandwiches in this wonderful city, but I'll be raising a 'wich at Coolhaus after shooting a couple photos for upcoming street food cookbook among the savory goodies like Korean BBQ nachos, shrimp ceviche and jalapeno cheddar corn cakes, we're going to have plenty of awesome dessert recipes, like Coolhaus owner, Natasha Case's Dirty Mint ice cream with double chocolate cookies. Mmmmm. If you could have an ice cream sandwich anywhere in the city, where would you go? 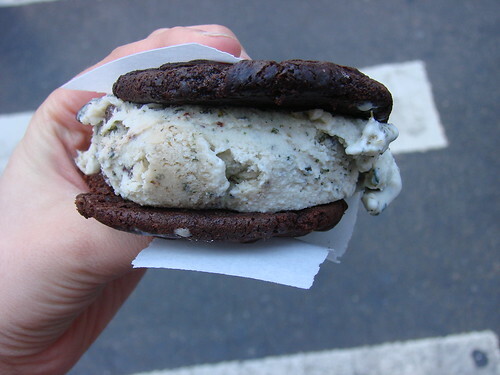 This is a wonderful shot of the Coolhaus ice cream sandwich! I had not realized it was national ice cream sandwich day until now. But thats whats great about reading your site, I can always look for your new posts and know that I am being introduced to wonderful food news and exciting food photos!